Contact form 7 Spam Prevention is an addon for the Contact Form 7 plugin. It helps you thwart spambots without using captcha by marking mesaages with multiple URLs as spam. If the user enters more than specified number of URLs in a contact form 7 it will display the spam message. You can change the number of allowed URLs in the shortcode. Eg. 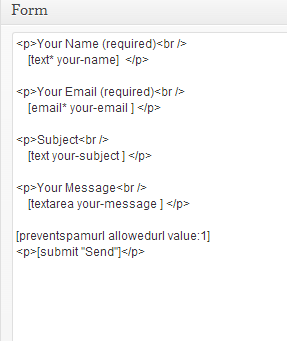 [preventspamurl allowedurl value:2] value:2 means the user is allowed to specify upto 2 URLs while filling up the form. In case more than 2 URLs are added, the message will be marked as spam. Unzip the plugin file and extract the folder. Upload the cf7_spam_prevention folder to the /wp-content/plugins/ directory. Copy the shortcode [preventspamurl allowedurl value:2] and paste it into your form code.